Concrobium Mold Solutions are manufactured by Siamons International. Siamons International was founded in 2003 to develop and commercialize an exciting new cleaning technology called “Concrobium”. The unique solution, which eliminates and prevents harmful mold, was put through its paces for two years, as we sought and secured EPA registration. 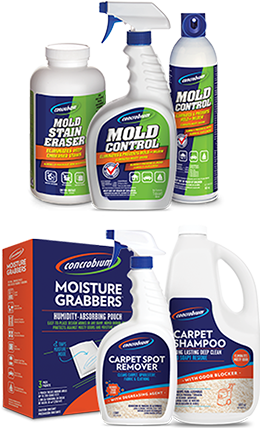 Since then Concrobium Mold Control has become a household name – no small achievement considering many people can’t even pronounce “Concrobium”! It’s sold by the largest home improvement and hardware chains in the country, and has become the solution of choice for do-it-yourselfers and professionals. Building on our success with Concrobium Mold Control, we’ve added a variety of products to the Concrobium Mold Solutions line up including our most recent launch; Concrobium Mold Stain Eraser, a new, high performance cleaning solution that tackles the toughest mold and mildew staining on decks, patios, grout and other outdoor surfaces. We’ve worked closely with homeowners, builders, professional mold remediators and property managers to help them address their unique mold challenges, to provide great solutions supported by knowledgeable, helpful people. Concrobium will continue to bring innovative solutions to market so that you don’t have to use products that are harmful to your family, your home, or the environment.